The inevitable happened today. Don’t get me wrong, Nathan has had some bowel movements to be reckoned with, but this one… ah, this one required some ninja skills, a light saber, and a never-been-used gas mask to clean up. Only my ninja skills disappeared along with my once flat belly, my light saber never existed, and the never-been-used gas mask had already been used the last time I attempted to rise to world tyranny. 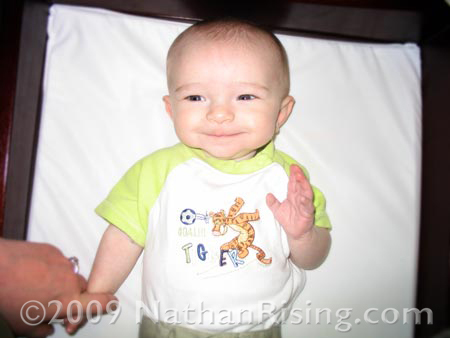 Nathan was bouncing around happily in his exersaucer, flopping from the front of the seat to the back the way a stereotypical deranged-maniac in a straight jacket bounces around a padded room. A gleeful smile was glued on his face and he was cackling, yes cackling, at the light fixture on the ceiling. Then he whimpered. It wasn’t a drop-everything-you’re-doing-and-run-to-his-side kind of whimper. It was the kind that said, hey just so you know, I’m here and something is slightly amiss. Only “slightly” turned out to be a drastic understatement. I retrieved my happy little boy from his exersaucer only to catch a whiff of poop. It didn’t smell so horrid at first, so I nonchalantly took him the changing table and undressed him. That’s when the odor hit. It was the most vile, noxious, funkified smell I have ever, and I do mean ever, smelled. The smell was so intrusive that it tried to suffocate me by invading the VERY PORES OF MY SOUL. The noxiousness of it had practically manifested into something physically tangible… the fumes shot out of the diaper with such force that I could feel my hair blown back from my face and could feel the odd sensation of my eyebrows being singed. And OH LORD HELP ME, I thought as I opened the diaper. I thought the smell was bad before… it was beyond repulsive. It was like decaying, muddy scum scooped up from the bottom of a pond after fish poop and other organisms’ secretions had amassed, undisturbed, for a millennium. So much so that the diaper COULD NOT CONTAIN IT ALL. It went up my poor kid’s back and seeped through his clothes. And I don’t mean it went partially up his back- I mean it went up to his shoulder blades. Lots of gooey, sticky, pond-scum smelling, eyebrow singeing, toe nail chipping, noxious poop. It took 12 wet wipes to scrape it all off. It smeared all over the changing table, so I had hold Nathan with one hand, hovering him about two inches over the changing table, while I wiped up the sticky smears that refused to easily come up with just one swipe. I had to scrub it off. Oh how I miss the poops from when he was exclusively breastfed, before we introduced formula as a supplement. In comparison, exclusively breastfed poop smells like lollipops and wipes off cleanly like crystal spring water flowing down a mountain. This, however, was the King of All Poops. “Hey, baby! How’d your day go today?” he’ll ask. “Really?” I’ll say. “You’ve never smelled anything like it in your life. You should smell it. I can’t be the only one.” To which he still refuses. I don’t blame him. But it’s still quite humorous to play around, especially since he knows that I’m not actually serious. I never thought talking about Nathan’s bowel movements would be the highlight of my day. I need to get out more. This entry was posted by Jen on September 3, 2009 at 2:45 pm, and is filed under Daily Life. Follow any responses to this post through RSS 2.0.You can skip to the end and leave a response. Pinging is currently not allowed. Yikes! The trials of parenthood, and what parents are quite willing to endure. It could be worse, like while you’re driving, or at the store, Church, ect. Then there’s trying to deal with a bad case of diaper rash in addition. My heart really goes out fer ya.